The Cronut may be the most popular hybrid food, but it certainly isn’t the first. Meet the boysenberry. The Cronut may be the most popular hybrid food, but it certainly isn’t the first. Way back in the early 1900s, a man named Charles Rudolph Boysen successfully bred a cross between a blackberry and a raspberry. If it had happened during the age of the Internet, the web would have blown up overnight with news of this wondrous berry. Instead, word spread slowly until it reached Walter Knott (of Knott’s Berry Farm), who began growing the fruit commercially and making it into preserves. He named the fruit boysenberry—proving that Knott was a modest man. Before you head out to buy a basketful of Boysen’s magical hybrid berries, study up on them with this mini guide. Where: Though Boysenberries originated in California, New Zealand is currently the largest producer and exporter. They are still grown in California as well as Oregon and other West Coast regions. When: Late May through early July. 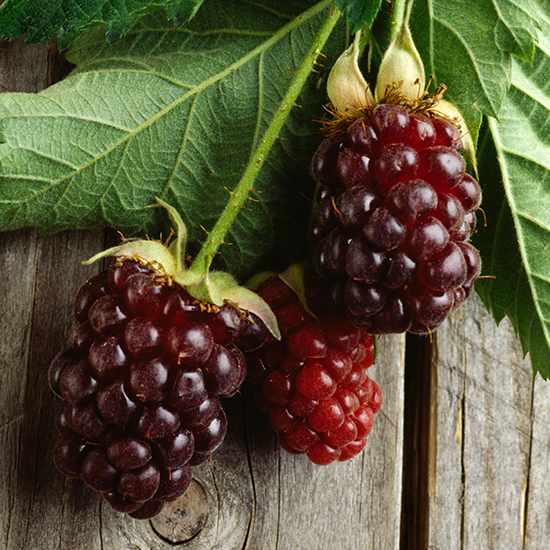 What to look for: A ripe boysenberry is plump, firm and an evenly colored reddish purple hue. Flavor profile: Unsurprisingly, the boysenberry tastes a lot like a cross between a blackberry and a raspberry. It has the juicy intensity of a blackberry, the sweet, floral character of a raspberry and a little bit more of a tang than either of its parents. Health benefits: Boysenberries contain a good amount of dietary fiber, vitamin K and a slew of minerals including manganese, iron, calcium and potassium. How to eat them: Though they’re terrific eaten fresh off the bramble, boysenberries are also delicious in jams, pies, tarts and custardy gratins.